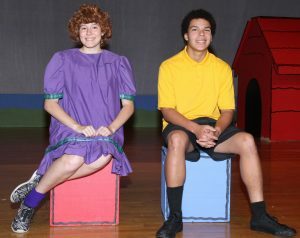 FULTON – While admiring her naturally curly hair, Frieda (played by Jadelyn Phillips – left) talks to Charlie Brown (played by Nick Brown – right) during lunchtime recess. The characters are part of Charles Schulz’s beloved Peanuts Comic Strip and are featured in the family fun Broadway musical, You’re A Good Man, Charlie Brown. The production will be presented by Quirk’s Players of G. Ray Bodley High School. It continues today and Saturday, October 26-27 at 7:30 p.m. each day in the Bodley auditorium.